Stone made the announcement on Thursday. During the 2016 presidential election, Singer was a staunch #NeverTrumper, but eventually warmed to President Trump. After Trump won the White House, Singer attended a fundraiser for the President-elect last December at the New York City hotspot Cipriani and personally donated $1 million to his Inauguration Committee. In February, Singer visited the White House to discuss the economy. In true Trump fashion, the President pointed out the thaw in his relationship with the hedge fund billionaire. 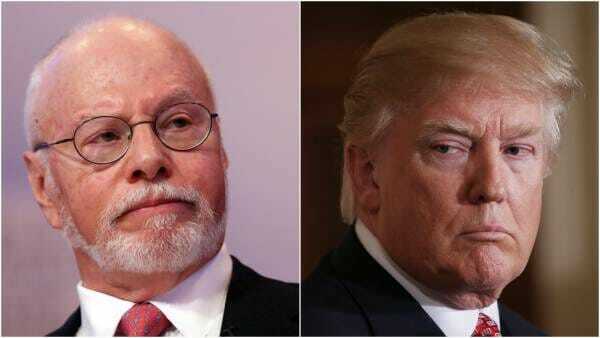 “As you know, Paul was very much involved with the anti-Trump or as they say ‘Never Trump’ and Paul just left and he’s given us his total support and it’s all about unification … So, I want to thank Paul Singer for being here and coming up to the office. He was a very strong opponent and now he’s a very strong ally and I appreciate that,” Trump said, according to CNBC. Singer’s #NeverTrump past supports Stone’s report, which aides for the Wall Street titan vigorously deny.